I am passionate about pubs. For me, they represent a part of British culture that goes back centuries. However, like many good old British traditions, the pub is under attack and could possibly disappear in a generation if something is not done to arrest the decline. People often forget that pubs don’t just sell alcohol; they put so much back into the local community. As a youngster, I grew up playing football for pub teams such as the Mons and the Prince Arthur. I witnessed how these pubs held social events and brought the local community together behind a common cause. As a result, both my parents and I made friends for life due to the existence of the local pub. When I was a student, I worked as a part-time barman in pubs and clubs to help fund me through college and university. My local, until recently, had a football team, a darts team, a pool team and even a golf team. It held race nights, sportsmen’s dinners, bingo nights and charity nights, and put an immense amount of money back into the local community. Local folk worked behind the bar and collected the glasses. It was a meeting venue for both old and young: a place where the elderly man from the care home could go and meet old friends, or where youngsters would meet early in the evening before heading off to late night-spots. Sadly all this has now gone. My local has become yet another victim and another nail has been rammed into the coffin of our local community. In an era when communities are becoming more distant, I believe the need for a pub as the focal gathering point of a community has become even more essential. When I was elected as an MEP in 2009, I made saving the British pub one of the central issues upon which I would campaign. At the moment, 25 to 28 pubs a week are closing. This is having a disastrous effect on local many communities, putting people out of work and costing the government millions of pounds in lost taxes. It therefore seems nonsensical to me for us to simply stand by and watch this great British tradition slowly die. We need to do something about it. 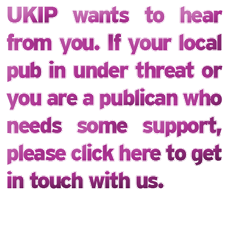 The fact that you have visited this website means that you, like me, are interested in saving the British pub. Therefore please sign our petition and get involved in our campaign. When I was a student, I worked as a part-time barman in pubs and clubs to help fund me through college and university.